My wife has gone in the past and quite enjoyed it. Please consider going no matter what jurisdiction you're in. 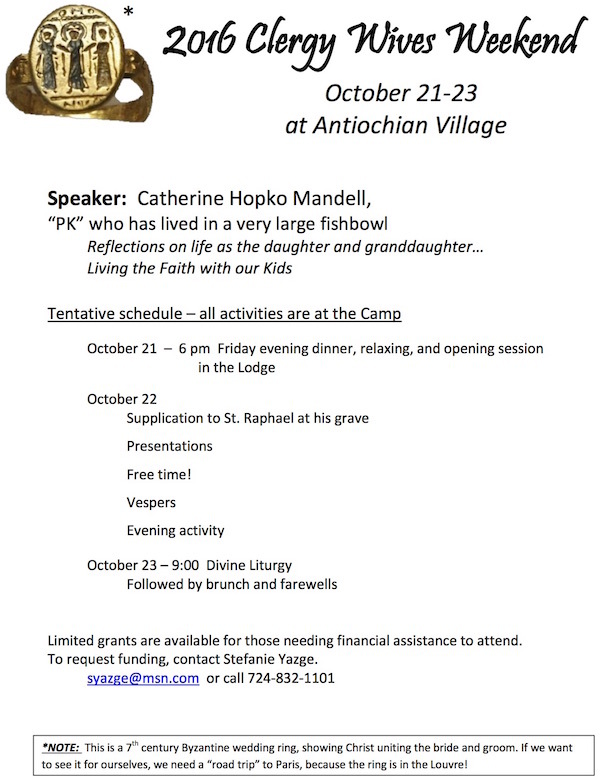 (Antiochian.org) - The 2016 Clergy Wives Weekend will be held at Antiochian Village the weekend of October 21–23. This year's speaker at the pan-Orthodox event will be Catherine Hopko Mandell, daughter of Fr. Tom and Mat. Anne Hopko, and granddaughter of Fr. Alexander and Mat. Juliana Schmemann. She is well qualified to speak from her understanding of life in the clergy family, and will reflect not only on her life as a daughter and granddaughter, but as mother and aunt. Matushka Anne will also discuss issues of raising our children in the Faith. The info and registration form can be downloaded here (PDF). Scholarship funding is available. To make a request for that, or if you have questions, contact Kh. Stefanie Yazge: SYazge@msn.com.